So its been a while coming back here and it seems that there has been a bit of talk with out riggers and the like. My Tempo that was shown here on my post was returned as it was faulty - and the biggest bloody run around was performed etc (anyhow Viking was at fault and honestly not a good company to deal with "full stop")! Do you spend much time fishing early morning or late at night or in busy waterways? 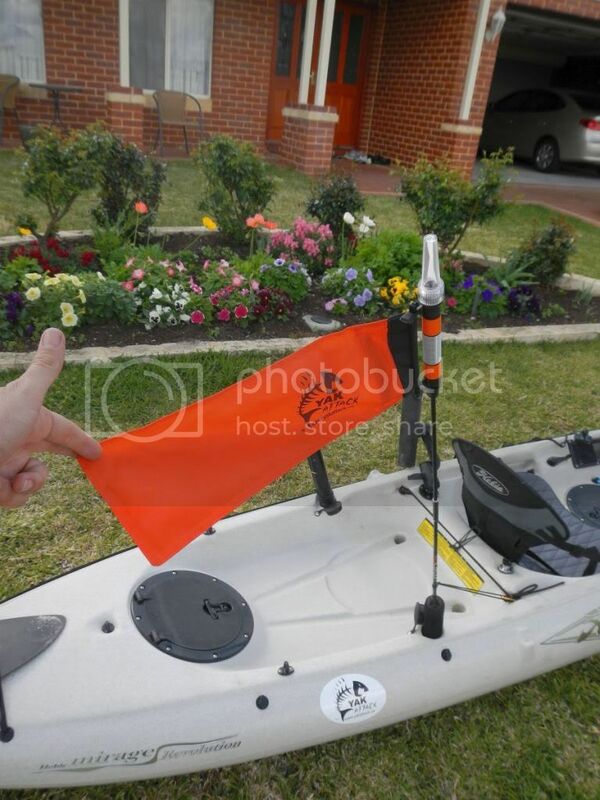 I have just added a Yakattack Visi Carbon Pro flag and light a bit over a 100 bucks landed in Australia but excellent quality and performs well . Packs down into the flag which is actually a pouch. slips into rod holder or comes with a number of different mounting options such as the ram 1.5" ball. Last edited by brendon; 26-09-2011 at 07:28 AM. The cooper anchors are also worth a look for yakin, only 1 kg made of plastic and very fast to grab bottom, still use it for my 3m boat! Ram mount 'light speed' rod holders where very handy as well. Cooper anchors are really an investment with kayaking! The lightness of the Coopers is pretty appealing. I had one as my only anchor for quite a while. Sadly they don't do everything, not even close. They're great on shallow sand. Read up on them and sand is what you tend to hear about. They're are okay on rocky bottoms. They're not much good if there's weed cover because they have trouble setting. And, once the water gets to any depth, they start to get pretty frustrating because they're light and sink slowly and because they need a lot of line out to set (look that up and be amazed). Deep water + weed and they're (in my experience) totally useless. Add current to any of the above and things get even harder. Again, because of the lightweight thing. I've taken to carrying two anchors: a small grapnel, which is now my go to because it gets down and sets quickly, and with some degree of accuracy. I also still carry the Cooper. When there's sand or mud I can't get the grapnel to take to I clip the Cooper to the back of the grapnel - with a bit of cord between the two. The grapnel gets the Cooper down, and the Cooper bites the bottom - a bit like a hook and sinker. Goitta say; anchoring has been, for me, a surprise point of difficulty. It wasn't really something I planned on learning about! I'd love to hear how other people work it. Last edited by jonnie; 20-01-2018 at 10:59 PM.